If you have ever had a shedding or long-haired dog, you will be familiar with some of the challenges of managing their coat. Whether it is dealing with copious balls of fluff that require twice-daily vacuum cleaning (see our article for recommended hoovers for dog hair) or keeping on top of mats and tangles that seem to magically appear despite regular grooming sessions. Not only can it be frustrating for home cleanliness but neglecting to give your dog a regular and thorough grooming can actually result in your dog becoming seriously uncomfortable, and they may need an extremely drastic all over clip to resolve the problem. There are some really popular grooming tools that can radically reduce the amount of shedding and make a huge difference when dealing with mats and tangles. It is important to choose a tool that is appropriate for your dog’s coat type, and you need to make sure that your dog is relaxed while grooming. Gradual introductions with lots of positive reinforcement using tasty treats is often required. See our in-depth article for more tips on helping your dog to have a relaxing grooming experience. Below are ten highly recommended grooming tools that, depending on your dog’s coat type, could be worth investing in. The Furminator Deshedding Tool was arguably one of the most revolutionary dog grooming products when it was first released on the market. Since then, in light of its success, there have been lots of other brands that have launched their own versions. This product is all about helping to cope with extreme shedding. It works best on the longer haired, double-coated breeds that shed excessively. So breeds like German Shepherds, Huskies, Labradors, Golden Retrievers. It is very important that these double-coated breeds NEVER have their coats shaved down so using a deshedding tool is one of the best ways to keep their coat manageable and comfortable. There are also some shorter coated breeds that shed a lot too. Dalmatians, for example, shed a lot of short hairs, and they shed year round too rather than just seasonally like some other breeds. Other short haired breeds that shed a lot include Shorthair Pointers, Pugs and Beagles. The Furminator is an extremely effective tool for getting into the coat and lifting the dead and loose undercoat out. There are some things to consider though. Make sure that you pick the Furminator that best suits your dog’s coat type. The one for longer coated breeds will likely be uncomfortable and could possibly even scratch a shorter coated breed. If your dog has a very thin coat, you need to use the tool very gently. It works most effectively after your dog has had a bath, when the coat is clean and free of dirt and debris. It does need to be used on a completely dry coat though, don’t try to use it when your dog is still wet or damp. If you can do the grooming session outside this would be the best idea, the amount of hair that can come off your dog is pretty epic, and wear clothes that you don’t mind getting covered in hairs. You may even want to consider purchasing a pet grooming apron. Don’t use the Furminator too often either; you don’t want to risk breaking unshed hairs with over-enthusiastic, overly harsh use. SleekEZ Deshedding Grooming Tool is a good alternative option to the Furminator. Whilst the Furminator usually comes out on top in terms of just how much dead hair it lifts out in one session, some dogs are not as keen on it as it can be a little harsh on sensitive skin or if you press down too firmly. The SleekEZ might not be quite as radical but it is still extremely effective at lifting out dead hair and, for dogs that do not like the feeling of being brushed or for short haired moulting breeds, it is a lot gentler and your dog may be more accepting of it. 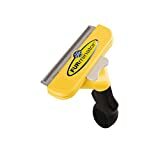 The other great feature about this deshedding tool is that it also works really well as a pet hair remover for soft furnishings, carpets, vehicle upholstery and clothes. It means no more wasteful lint rollers or sticky tape! Some dog’s nails grow more quickly than others and depending on how and where they are exercised you may need to have a method of keeping them at an appropriate length. If your dog’s nails become too overgrown it can cause mobility issues and, if they become extremely overgrown, they can start to double back on themselves and cut into the pads. Some dog’s do not like being restrained, having their paws held in place and having their nails clipped. It can be even worse if you accidentally cut too far down the nail. If you cut into the quick, the blood vessel that travels up the nail, it can be extremely painful, and there can be a lot of blood. If this happens it can make your dog even more averse to having their nails clipped the next time and, if they are struggling, this can make the chances of cutting into the quick even greater. If you are in this situation, we would recommend going back to basics with working on desensitising your dog to having their nails clipped. Our full article on nail clipping provides some detailed guidance on how to do this. Another option that may help, along with the work on desensitising your dog, is to consider using a nail grinder rather than a set of clippers. A nail grinder means you won’t end up accidentally cutting through the quick and a lot of dog’s tolerate it much more readily than the clippers. The Dremel Nail Grinder Tool is one of the most popular and well-reviewed models on the market. 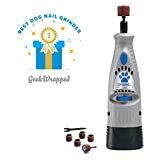 It is considerably more expensive than a set of nail clippers, and you will likely still have to do some work to get your dog used to using it with the help of lots of yummy treats but it could help to make nail maintenance a lot less stressful for you both. Kong products are usually synonymous with high quality and functional and useful designs. The KONG ZoomGroom is an extremely well-reviewed curry comb style grooming option for dogs. It might not be quite as jaw-dropping in its shedding capabilities as the Furminator but it still works really well at lifting dead hair out of a coat, and it does it very gently, making it more like a massage for your dog. If your dog doesn’t like the combing sensation of a normal deshedding comb, then this may be a better alternative to try. With products like the Furminator you have to watch that you are not being too harsh or using it too frequently. This is a great option if you want your kids to get involved in a grooming session and it would be fine to use this every day. The ZoomGroom also works really well for helping to build a good lather in the bath and for working the shampoo deep down into the coat. If you have a double-coated long-haired breed like a Bearded Collie or longer haired Yorkshire Terrier, without regular maintenance their coat can easily become very matted and uncomfortable. This is also true of curly coated Labradoodles, Goldendoodles, Cockapoos and some other Poodle Crosses that are growing in popularity. Labradoodles with these dense, curly coats can become extremely matted all over their body if they do not have a very regular and rigorous grooming regime. If this is neglected, they often have to be shaved right down all over. It is very important that with any long-haired breed you keep on top of their grooming and do not allow mats and tangles to develop. Once they become extremely dense, really only cutting or clipping out will work, and it can also be extremely uncomfortable and even painful as it pulls on the skin. Using a regular comb and slicker or undercoat rake can work really well for general maintenance, but to get out the teases and tangles or early stage mats sometimes a dematting comb is the best option. The Pat Your Pet Dematting Comb has two sides. One with 9 teeth that is generally used first for helping to tease out tangles and mats and then a 17 tooth side that is extremely useful for general deshedding. It is very well reviewed and, providing you are careful and gentle about teasing any mats out, most dogs will tolerate it well if the session is accompanied by lots of yummy treats. It is not a miracle product though, and if your dog has a coat that has been neglected and has lots of extreme mats, then a trip to the groomers or a DIY clip down will likely be required. Many of us don’t like the mess, stress or skill that it will require to clip down our dogs and would much prefer to just take them to the groomers to have it done professionally. If you are not so worried about their cut being perfect but would rather it was just functional and made them more comfortable, especially during the hot weather, then perhaps you will want to give it a try yourself. If your dog needs a regular clip down in the warmer weather or to save so much general grooming, then you can be back and forward to the groomer on a regular basis, and this can become very costly. Whilst a good set of clippers will be an expensive initial outlay, if you continue to use them regularly for your dog, over time you will save a lot of money in comparison with always paying for a professional grooming session. Clipping your dog yourself can also be worth it if your dog is extremely frightened of going to a salon or the whole grooming process in general. It allows you to work on a desensitisation process to get them used to the clippers gradually and to make them feel more relaxed. If you do plan to do this yourself, investing in the right equipment, making sure you are only clipping your dog if they have the right coat type for this (NEVER shave down a double coated breed), getting a little tutorial on how to do a good job and also how to help your dog stay relaxed through the process is important. If your dog is nervous about clippers, then it is important to take things very slowly and build up to using them on their body. Start with just letting your dog see the clippers and reward them with yummy treats whenever you bring them out. Build up to then turning them on and off at a distance from your dog whilst rewarding them every time you do this. Then move them closer to your dog and so on. When you do start grooming them, keep the sessions short and always combined with yummy treats. You may want to get someone to help you so that they can treat your dog whilst you groom or you may want to give them a stuffed treat toy like a Classic Kong. Even if you have to leave your dog partially groomed the first few times, it is important not to push them too far too fast. The goal is for your dog to associate a grooming session with fun things and to be nice and relaxed throughout. It really is worth investing in a good quality set of clippers. A lot of the cheaper options don’t clip the coat down as effectively (sometimes even causing soreness for your dog), can be noisier, heat up very quickly and they usually don’t last as well. Some of the cheaper ones won’t even work on denser coats. Andis are one of the brands that are synonymous with good quality. It is a brand that is used by many professional groomers. 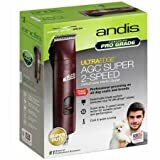 The Andis UltraEdge Super 2-Speed Professional Dog Clippers get great reviews, and for such a high-quality set of clippers, they won’t break the bank. Their blades remain sharp for longer, you can obviously buy replacement blades though if needed, they also does not heat up quickly like some other brands, it is much quieter than many other models, and it is very powerful and, with the right blade, will deal with mats very effectively. 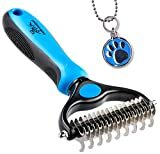 So if you feel brave enough to have a go yourself to save some money or you want to try to give your dog a more relaxed grooming experience at home, then this could be the set of clippers to consider. If you have a dog that is very nervous when it comes to combs and brushes and you have a smooth coated breed that sheds a lot, then this could be the product for you. By using a grooming glove to lift away shedding hair, it can be a much less intimidating and often extremely enjoyable experience for your dog. A grooming session like this can increase the bond between you and with the HandsOn Grooming Gloves you have a grooming mitt that is recognised as being one of the best on the market so it does still work very effectively in terms of removing the dead hair. Some Mitts are pretty useless and don’t pick all that much up. Okay, it is no Furminator, but if your dog is not keen on a tool like that, then they are much more likely to tolerate a grooming session with gloves like these. It also allows you to gently work around areas that it can be hard to reach or where it could be uncomfortable with a harder brush like delicate areas around the face or under the tummy and in between the legs. It can also be used as often as you like with no worries of accidentally cutting the coat if you are over-grooming or pressing at an awkward angle. It can be useful for using during bath time too as it helps to promote a really good lather and gets the soap deep down into the coat for a very thorough clean. Because it comes in a variety of different glove sizes, it also means you can get a really snug and comfortable fit and the glove is not going to slide off your hand with every swipe as it can do with some other grooming mitts. 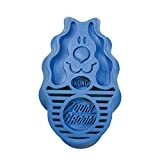 If you have a dog that is extremely intimidated by the shower head whenever you try to give your dog a bath, then the Aquapaw Pet Bathing Tool may be useful to try instead, along with lots of yummy treats to ensure they start off with a nice positive association with it. 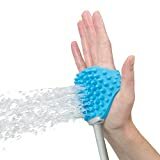 This hand pad water dispenser attaches with a hose to your existing shower (fittings are provided) and then it means that the water is effectively being dispensed directly from your hand. It can also be good to try to minimise the amount of water that often manages to go everywhere when you are bathing your dog. The hand pad controls the flow of water and, with a click, it can be turned on or off again, and it also means that the water can be kept close to your dog’s body. Some users also feedback that it can be really useful for helping to clean a dog with a very dense coat properly. Because the water flow is coming directly from your hand, you are able to get the water directly into the coat to give it a good soaking rather than it just rolling over the top coat. 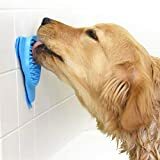 If your dog is extremely nervous at bath time, it is not likely that this will be a miracle cure, but a lot of users claim that their dog is more comfortable with this than with a standard hose or shower head. If you are trying to help get your dog more comfortable being groomed or bathed, if you don’t have someone else there to help you with frequent treat rewards then it can be a tricky task. Having a product like the Aquapaw Slow Treater Treat Dispensing Mat can be really useful for helping to get your dog to associate these tasks with good things whilst still allowing you to get on with the job at hand. In the bath, it sticks very well to the tiles around the shower area, and if you are grooming elsewhere, as long as you can find a suitable surface to attach this to, you are good to go. By smothering the dispenser with some of their favourite wet food, peanut butter, banana, squirty cheese, healthy baby food or some other suitable soft and squishy treat your dog can then be working to lick the food out of the dispenser giving you a decent amount of time to bathe or groom without having to worry about also providing food rewards. If your dog has severe anxiety issues, this may not be a solution until you have worked on reducing this slightly. When dogs are in an extremely heightened state of stress, they are usually too agitated to take food or treats. But if they are just slightly anxious or they get bored and fidgety, then this could be a great solution. It is also good for just helping to keep your dog mentally stimulated at other times, or when you want to keep them distracted in other situations, not just for a grooming session. It is not an indestructible toy though so if you have a very chewy dog then opting for a tougher treat toy would be better, especially if you are leaving them with it unsupervised. If your dog has some little mats and tangles, it can be a challenge to work these through gently, even with a good dematting comb. By using a good quality detangling spray, this can sometimes help the process along more effectively. It can be great to spray a little of this through the coat after bathtime, when the coat can become a bit tangled after the rigours of the cleaning process or just when you plan to do a general grooming session. Not only can it help to make it a more comfortable experience for your dog but it means it can speed the process up. The BioSilk Therapy Detangling Mist is a well-reviewed product. Some detangling sprays receive poor reviews for leaving a build up in the dog’s coat, but this one is light, has a pleasant smell, uses high-quality natural ingredients and receives a lot of great feedback. As with any grooming product like this, we would always recommend trying just a small amount to start with to ensure that your dog does not have any sensitivities that would cause them to have a poor reaction to the product and don’t forget that it is not a miracle product. If the mats are very severe then using a detangling spray isn’t going to make a difference and they will likely need to be cut or clipped out.